Don’t stress about bringing all of your baby equipment with you on your vacation to Los Cabos; have all of your favorites and necessities waiting for you upon your arrival! 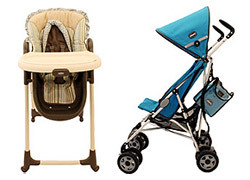 Baja Baby Gear has everything you need including strollers, cribs, car seats, exercisers, play mats and so much more available for rent! Let their quality equipment rentals eliminate the stress of having to pack all of the essentials for your small childwhen traveling to Los Cabos. We can have equipment conveniently delivered to your villa. Their high quality equipment rentals and great service will ensure that you have everything you need for your toddler or infant during your Los Cabos vacation getaway. Fee for airport area delivery is $20, $100 for Todos Santos and $75 for Cerritos. Standard delivery hours: 9am-5pm. Fee for delivery outside standard hours is $15. Baja Baby Gear is closed on Christmas & New Year’s Day. Clients are subject to a late fee if they are late to pick-up/drop-off items. Clients are responsible for paying for missing or damaged items. Items that are heavily soiled will incur an additional cleaning charge of $15 per item. Baja Baby Gear reminds clients to not take battery operated toys to the beach or pool areas.